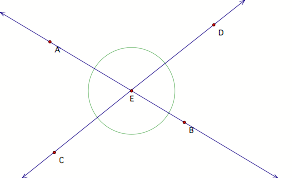 The above figure shows and intersecting at E. List all the statements about the angles in this diagram that you think are true (see #1 for an example). Use the notation to denote �the measure of angle DEA�. Assume all measures are relative arcs. On the back of this sheet, list the hypotheses that seem to be true. Pick one of these hypotheses. Provide an argument for why it must be true. Here is an argument that hypothesis #___ is true.